This Memorial Day weekend, I was lucky enough to visit Phoenix Comicon Saturday and Sunday. This con rocked. I had a wonderful time, and I can't think of a negative thing to say. I will have a full con report for you late tomorrow or Wednesday, but until then, check out some of the many costumes I saw at the con. My favorite costumes were this steampunk dressed couple on Saturday. The gentleman had a kickin' functioning backpack too. This cat head was so realistic that it caught me off guard, and I might have jumped a little. Wow. I saw a lot of furry costumes at the con. Really great Padme Amidala costume, I believe she was with the Rebel Legion. I was really impressed by this Na'vi costume. He looked like he stepped right out of the movie! Jareth from the Labyrinth is made to be cross-played. You can see about 30 more photos over here. Yes, you can eat geeky! 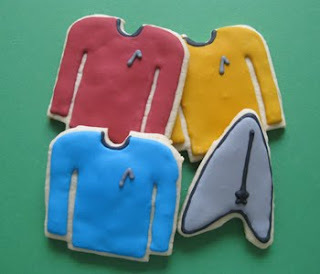 Geeky Cookies has got you covered when it comes to delicious nerdy desserts. They've got cookies from Star Trek (left - and yes, we all know that the red one gets eaten first! ), The Guild (below is Codex's Staff), Mario, Pac-Man, and more. The occasions that one can get geeky cookies for are numerous. They are a great gift for any holiday, good for cheering up a geeky friend, and beyond cool for parties or marathons. And think how much love you would get if you brought these over to your D&D session! The DM might even let you off the hook if you bribe him with some Adventurer cookies. You can never go wrong with gifting cookies. Ever. Even though I am a person that likes to cook and bake, I have to admit that I'm usually lazy. 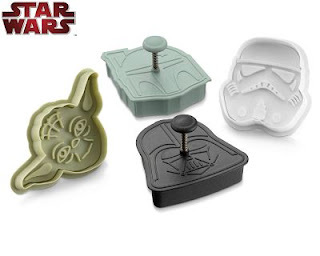 You know those Star Wars cookie cutters I mentioned a couple of weeks ago? 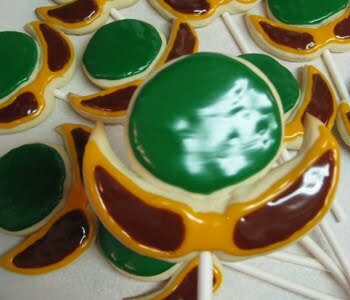 I will probably make those at least five times before the cookies ever actually get decorated. So it's a nice treat to buy tasty cookies that are also iced and decorated. One other reason I adore this site? Their FAQs are in LOLCat speak. Time for a new regular feature at this blog. Actually, it might be the first regular feature. Hmm. Anyways, every other Thursday I'll be featuring a shiny webcomic. Slang, made popular by Joss Whedon's Firefly. Means good, great, neat, wonderful, etc. The requirements to be featured are few, but both are very important. The webcomics has to be shiny and updated on a consistent basis. It might be newer webcomics or ones that have been around for months or years. I will always provide a link to the first strip regardless. The first webcomic to be featured is a relatively new one that I am absolutely smitten with - Gronk by Katie Cook. On the surface, it's a story about monsters. One little monster in particular. But there are a lot of bigger issues about belonging and deciding who...or what you want to be. 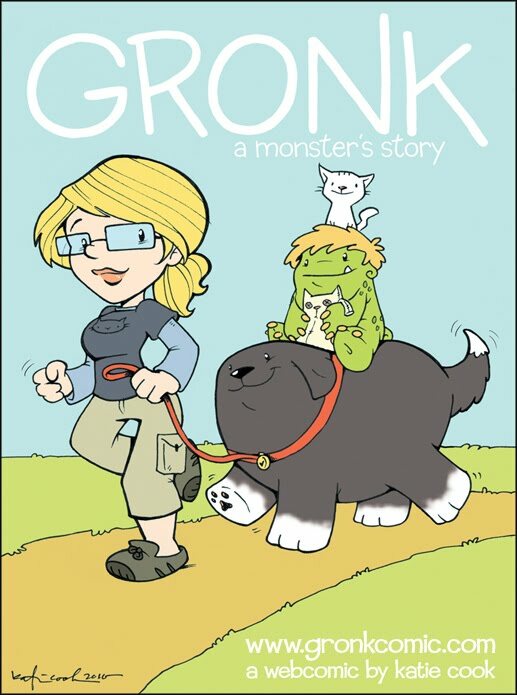 You see, Gronk is a young, very adorable monster who doesn't really like being a monster. While we're not sure what exactly will happen to her or if she will leave the other mean ole' monsters soon, you can get an idea about what might happening by reading more about the characters of the comic here. Cook has created a character that instantly grabs the reader's attention. And not just because Gronk the monster is the epitome of adorable. We can all relate to her feelings of being different. Cook is just four strips into the story, and I'm incredibly attached to Gronk and her stuffed kitteh. You know you're intrigued! Jump over to the site and read the first strip, you'll be hooked. What is steampunk? I hear that question a lot, and only learning of it in the past four-six years myself, I still grasp at giving a meaningful definition. I discuss that briefly and give an overview of steampunk costumes over on this post at Pink Raygun.com. Though I am an internet addict (I refuse to calculate how many hours I spend on the internet in a day), the phrase "net neutrality" is relatively new to me. I first learned about it just a month or so ago after the Streamy awards at the Celebrate the Web event. I know I'm not the only one either, so I want to help get the word out. Net neutrality advocates equal use of the internet without any restrictions from internet service providers (ISP) or the government on content of sites, platforms, or the modes of communication. Local cable, satellite, or telecommunications companies should not be able to slow or block the delivery of popular content sites. Nor they should they be able to guarantee uninterrupted high-speed access to certain services for a fee. For example, ISPs shouldn't have tiered levels for different types of internet use or bandwidth cosumption. An internet user shouldn't have to pay an additional $10 per month to his or her ISP just to have access to YouTube for example. One rate should include access to all of the internet. With net neutrality, the network's only job is to move data and not to choose which data gets special higher quality service. Who doesn't like net neutrality? The answer is not that surprising. The big companies like Comcast, AT&T, Verizon, and Time Warner want to have control over the loading of internet sites. They would like to be able to charge you more so that for example, you can watch a video on Hulu without waiting for it to buffer. Or maybe the level of bandwidth that would support a game such as World of Warcraft would cost more. They'd also like to slow down or block the search engines and tools of their competitors, while of course boosting their own. They are lobbying the FCC and Congress to get rid of net neutrality. See the photo above for an example of what could happen if they are not regulated. The repercussions of having large companies control the internet like puppeteers could be devastating. I've only barely touched the basics of this important subject, just enough to bring the topic up and hopefully get you interested. A ton of great information about the topic is available at Save the Internet. I encourage you to go read more and tell your friends about it. Please feel free to contribute your thoughts in the comments. 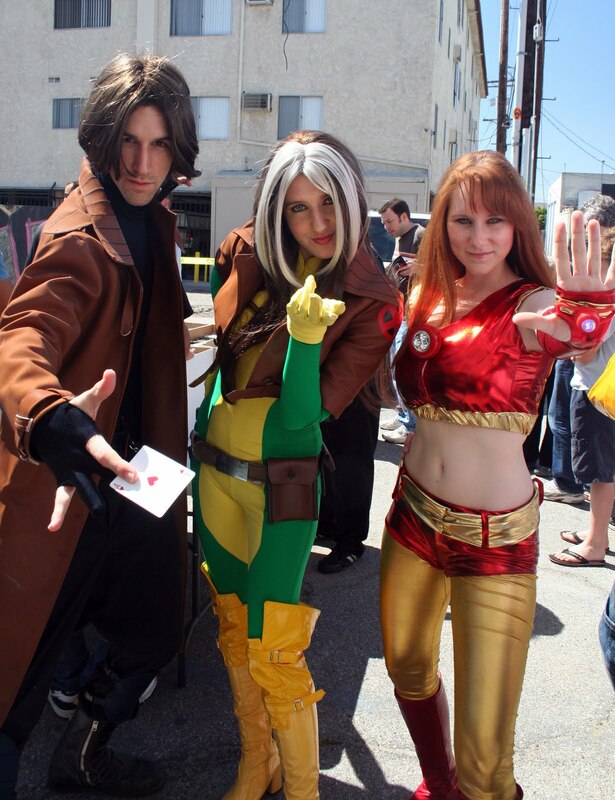 The Los Angeles Rock'n Comic Con is almost here. It also is going by the Pasadena Rock'in Comic Con in case you think there are two conventions going on this upcoming Memorial Day weekend. This is the inaugural event for the show and, it is being held at the Pasadena Convention Center. You can attend Friday through Sunday for $60, but don't forget to register online first. Their site states that they will not be offering onsite registration, which I find a little odd. It looks like they have the convention standards - vendors, artist's alley, a masquerade, panels, etc. I will be at the Phoenix Comicon during the same weekend, but I wanted to be sure to post something since I haven't seen a ton of advertisments about the con. I will be at the Phoenix Comicon this weekend, so if you attend the rock'n comic con, let me know your thoughts. Oh and look up the Supa Pirate Booty Hunt booth while you're there! Since I have now visited the Southern California Renaissance Faire twice, it is definitely time to share another interview. This time, I interviewed vendor A. Dawn Wolf of the Hallowed Tree booth. How long have you worked faires, what is your current job? I've been working since them 2000, so that's 10 years now... wow how time flies. My current job is working at a booth called Hallowed Tree that sells puppets, furniture and toys. 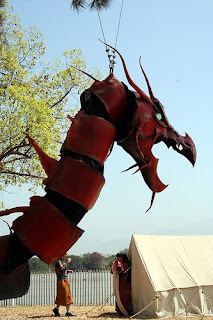 What is the most challenging part about setting up at renaissance faires? Putting up the entire booth! It takes several weekends. Also removing the splinters afterwards. Do faire workers/peformers mind being called rennies (not sure if that's like Star Trek fans hating the word Trekkies)? I haven't been called that, that I remember. But I can't see people at the faires I've worked really hating being called rennies. Are you responsible for making your costume and making sure it's period? Our costumes are required to be as period as possible. So that's at least two skirts, a chemise, bodice, belt, and two items covering my hair (snood and hat). I used to make my own costumes, but I don't have the time anymore. Luckily, one of my friends is a seamstress, so I tend to have my outfits made by her now. Her stuff is so much better than anything I've ever sewn together. What happens after the crowds leave? Immediate clean up and outta there or hang around and have shindigs? Depends on which faire I'm at. I'm a huge nerd, so my shindigs tend to be playing Dungeons & Dragons, watching movies like "Serenity" or just hanging out with friends. Yes, a group of us actually have an ongoing D&D campaign that we play after hours. Some might find it very dull, but most of the time these are friends that I haven't seen for a year, so I feel like hanging out with them. Do you/have you worked at multiple faires? In the past I really did, back in the days when gas was cheaper and I had a full time job on the week days to pay for the travel. But even then I tended to stay around the California faires. Like Northern California Renaissance Faire, Santa Barbara Faire, Southern California Renaissance Faire, etc. Now it all depends on if I have the extra cash to pay for traveling or if I can bum a ride from someone. What's your favorite thing about working a faire? So many things. I would normally say that it's because I have a love for dressing up, but it's more than that. I think it's the people. I'm around people that are having fun, dressing up, street acting, and enjoying a simpler time. Plus I love working with others that have the same nerdy interests I do. I can't go to weekday work and debate over D&D 4.0 or quote lines from a favorite web comic that just came out. Also the talent. In my booth I have a seamstress, knitters, yarn spinners, a couple of singers, a jewelry designer, a movie prop designer, a wood craftsman, and several others that I'm probably forgetting. I'm the token artist. I think it's awesome to know that some of the renfaire workers might be hanging out after and playing D&D. Makes me adore them even more. Also, as a side note, Wolf also has a kickin' webcomic called Zombie Ranch. If you would like to be interviewed for this series, please contact me – alratcliffe@yahoo.com. I'm not sure if you guys have noticed, but I take a lot of photos. One of my cameras is almost always in tow, and especially so when I go to events like a renaissance faire. I am that annoying person that is always stopping to photograph a flower or a sign and sometimes it just seems like I am stopping for no reason at all. While at the renaissance faire, I shoot a lot of costume photos. Since I returned to the renaissance faire yesterday (I managed to get free tickets while visiting last weekend), and took several more photos I thought I would share my favorite costumes of this year's renaissance faire with you. Pink furry unicorn, because why not? Just look at those pants! For lots more photos of renaissance faire costumes and food, go to my Flickr page. Do you know about the webcomic Wapsi Square? Hopefully, you do. If not, you should go visit after this post. 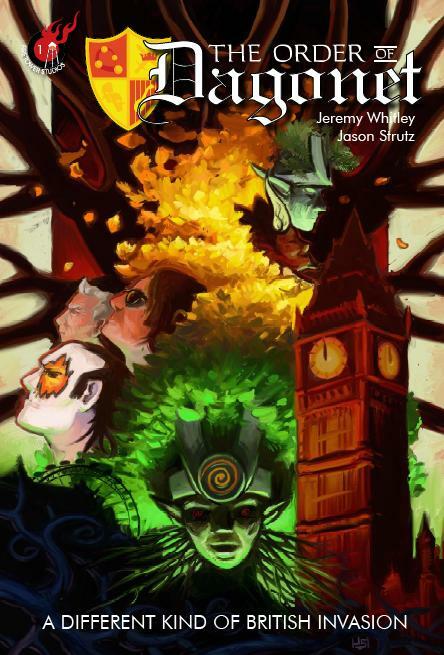 It's a great comic about strong characters, dark humor, and fantasy. The Wapsi Girl Project was re-started when Monica (pictured on left), the protagonist of Wapsi Square won the 2009 Lulu Award for Best Female Character. You see, all the girls of Wapsi Square are strong, intelligent, independent, and I could keep going all day. They are positive role models to say the least. The project asks contributors to explain what makes them Wapsi Girls. So I sent in a few words explaining what made me a Wapsi Girl, and I was quite chuffed to be included. Check out all the ladies of the Wapsi Girl Project for some serious inspiration, even if you're not a girl. You can even send in your own submission to become a Wapsi Girl. "I’m inspired by television and movies from my childhood. It’s funny how you watch some of those things today and wonder why you were so obsessed with them at the time. I remember the Fonz being SO much cooler than he actually was. My paintings are basically just placards screaming ‘Childhood! It was amazing! I want it forever, please!" 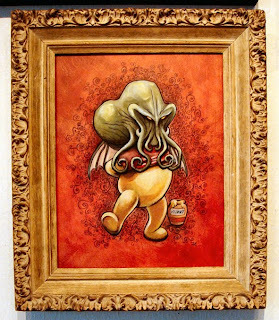 He has a knack for combining the world of fantasy and the world of the real. I was immediately struck by this balance. In his art, you easily accept Superman with Grover as an absolutely real thing and Batman featured in Starry, Starry Night? Well, it just looks like he always belonged there. 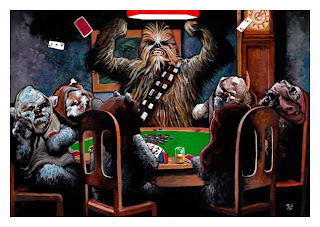 I've shared a few of my favorite images in this post, but it best to go visit Hance's website to see whole pages of awesome paintings that are sure to make you grin and laugh like a Wookiee. You should also check out his interview with GeekDad of the website Wired. 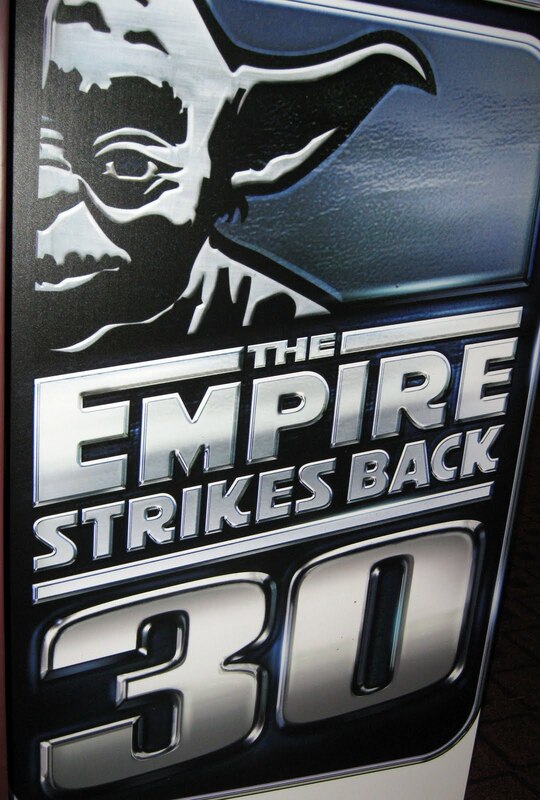 Last night in Hollywood, fans and stars gathered to celebrate the 30th anniversary of The Empire Strikes Back and to give to St. Jude. Lucas is commemorating the 30th anniversary by having a year long campaign to raise funds for various charities. St. Jude was the beneficiary of this Empire Gives Back event. Arclight Cinemas hosted the event. Attendees to this event raised $40,000. I arrived as early as I could, but once I realized that the seating was already assigned I dashed to the restroom. This is important to note because on the way, I almost put my foot right in front of Peter Mayhew's cane. 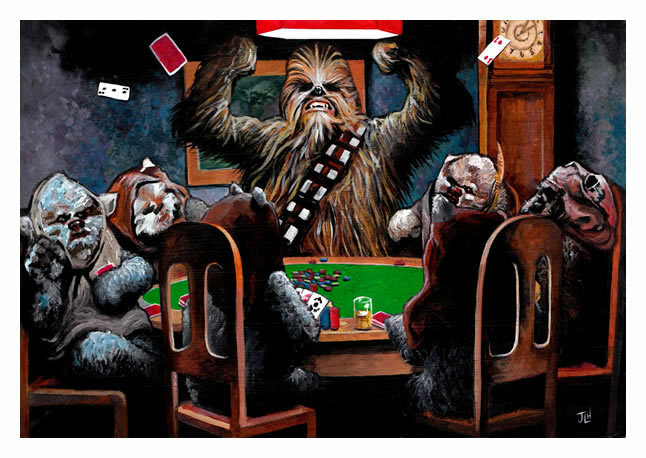 Yes, I could have killed Chewbacca. Fortunately I put the brakes on just in time. One of his handlers gave me a look. Mayhew didn't actually notice. And yes, he is that tall in real life. Soon, I saw Harrison Ford arrive. He was followed by Billy Dee Williams and Ewan McGregor. They all walked the red carpet and stopped to talk to reporters. Fans were allowed to get pretty close, though my lack of height prevented me from getting many decent photos. Surprisingly, I only saw one Jedi robe. Vader and two Stormtroopers were on hand at the end of the carpet. They kind of had to be there, it wouldn't be a Star Wars event without them. I also spotted Dave Filoni, Jamie King (the voice of Aurra Sing), and Mark Hoppus of Blink 182. I heard that Jon Favreau, Catherine Taber, and Christopher Nolan were there. After I stared and tried to peek between the tall photographers for a while, I decided to head into the theater. The film was being screened in two theaters. I was in the smaller one as I had waited too long to purchase my ticket. Billy Dee Williams came over and stood right in front of my seat to introduce the film and thank everyone for coming. As for seeing it on the big screen, what can I say? It was an amazing experience. I was lucky enough to see the re-release back in the 90s, but my limited memory doesn't quite stretch back far enough to remember all the glory of seeing it big. For me, the most stunning feature was the sound. When it is so loud and rich, you really see and hear how much it contributes to the movie as a whole. The crowd was also great, cheering in all the right places. Star Wars fans are some of the nicest I have met. Fans clapped and cheered as the film ended. 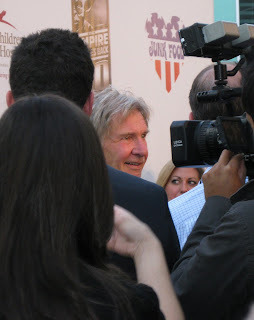 Harrison Ford was brought in front of the audience for a question and answer session with Geoff Boucher of Hero Complex. It was simulcast into the second theater. Ford was clever and seemed to be happy to be there. He had to fess up and admit that he hadn't seen Empire since 30 years ago. He watched Star Wars last week in preparation for the event, and he remembers thinking that Alec Guinness was a wonderful actor. A wonderful, old, actor. So he did the math. Back then, Guinness was six years younger than Ford is now. Realizing this "gave him pause." Boucher asked some familiar questions, but I still heard some new things. Ford feels like he's been a really lucky guy to be involved with Star Wars. "The originality of it was very striking for the time. The mythology really made it work." He also said, that watching it in the theater really showed just how much the THX sound was the "glue of the piece." Ford related the story of how he got the part; he was building an elaborate portico for Francis Ford Coppola's office when George Lucas asked him to audition. He read with tons of other potential actors, and eventually they offered him the part. Boucher asked him when he found about the big Vader secret. Ford kind of gave him a look and said he did read the whole script and knew along. He thought it was a "cool twist." Boucher mentioned that fans think Han Solo has the best lines. Ford said he never thought that at all. He was just happy to be involved and to have a part - "a keystone effect" - among the great ensemble of actors. He thinks Solo represented something close to the audience's sensibility because of Solo's distance to the mythology. They briefly discussed whether the filming was arduous. Ford stated the only "uncomfortable" part was Norway. He was originally supposed to shoot his snow scenes on a stage, and his costume was built for that. Not for the Norwegian cold. He got taken there at the last minute, and the only way they could get to set was on a snowplow train with an auger on the front. The crew stood in the door of the hotel shooting because it was so cold. He stated, "Other than that, it was a piece of cake." One of my favorite moments was when Ford discussed Peter Mayhew and Chewbacca (it was also Mayhew's 66th birthday) and the crowd gave their wishes by making their best Wookiee sounds). Ford had great sympathy for Mayhew being cooped up in that suit and said it must have been just miserable. He said that the cockpit of the Milliennium Falcon wasn't finished until the first day of shooting in it. They climbed in eagerly, Ford was excited to check out "his office," but Mayhew couldn't fit in the seat. Oops. I had no idea that he was edited in for the first film for the Falcon cockpit shots. While on the subject of the Falcon, Ford also stated that no one knew how to drive the thing. They sort of made up the flying sequence on the spot. In the first movie, they also were on a strict budget. They bought toggle switches for the Falcon. So you could flip them, but then the camera had to switch frames because the switches would just fall back down. He mentioned that was fixed after the first movie. Ford did state that he told Lucas that Solo dying would supply an emotional bottom. Lucas didn't agree, so it didn't happen. He did get to prove Lucas wrong in one instance though. For the "I love you," "I know" exchange, Ford and Irvin Kershner thought that "I know" worked much better than "I love you, too." Lucas thought people were just going to laugh. But Ford thought it was a "good character smelling moment" so when they test-screened, they used "I know." It ended up in the film, so Lucas must have thought it was okay. One of the final questions asked was whether Ford could think of any scenes that were deleted from final cut that were especially memorable. He answered, "No. George used everything he paid for." It went too fast, but for this fan, it was a once in a life time event. It could be topped by a visit to Skywalker Ranch. I don't suppose anyone knows a guy who knows a guy? Hey, it's worth a try. Star Wars.com has their report of the event here. 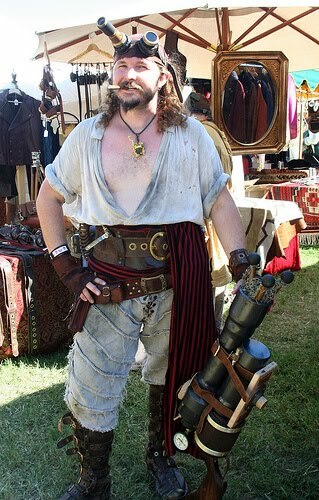 Last Saturday, I attended the Southern California Renaissance Pleasure Faire. Fortunately, I didn't have to say the name out loud too many times, it's kind of a mouthful. This is my fourth year attending this faire, and overall, my thirteenth consecutive year attending renaissance faires. And to think my mom thought I would only go once because my high school boyfriend was going. I went to the Southern Ohio Renfaire for most of the those years and the Northern Ohio Renfaire whenever I could. But now I've moved, and I'm just happy there's a faire within driving distance. Not only that, but apparently it's the original renaissance faire. I started my day off as I do any other trip to faire, by running right to the food court barely pausing for anything on the way. I highly recommend the shepherd's pies and a toad in the hole. I had a loose agenda for the day. When I visit a renfaire for the first time, I usually look over the website closely before attending so I can plan shows to attend and make notes about vendors that I can't miss. But after I've been a few times, I get lazy. I knew I wanted to finally buy a pair of sandals for my costume and see at least Moonie and/or Broon. Oh, and eat lots of food. Success on all fronts. I got incredibly soft and comfortable leather sandals from Native Earth Shoes. I saw Moonie (that photo of Broon is from last year), and in seven hours I ate an impressive amount of grub. I even ran into the Mad Hatter and company, go figure. I've learned at ren faires, there will always be a Conan and sometimes a Klingon. So why not Alice in Wonderland? You can find lots more photos here. Do you guys attend renfaires? If so, which ones? I know you're jealous of my zany patterned blanket, but I am keeping that (you can get one of your own at Ikea). You get the comics though! There are two awesome prizes. 1. Leave a comment on this post by 9:00pm Pacific Standard Time on Friday. You can even do Anonymous comments but please put your Twitter name or your email address so I can contact if you win. 3. You must live in the US to be eligible. I will be shipping these packages via UPS, so I will need a street address if you win, not a PO Box. After the deadline, I will choose a name from the comments using a list randomizer. The first two names win. The first name gets first pick on the prizes. 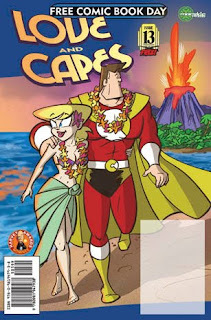 To learn more about many of these comic books visit the preview page at the Free Comic Book Day website. Cross posted on the awesome site, Geek Girls Network! ﻿Sometimes you come across such talented, fresh artists that you want to tell all your friends about them. Then they turn out to be great writers and really nice people, and you want to tell the world, shout from your virtual rooftop. Chris Howard is one of these artists. And here I am shouting. Howard manages to keep himself busy. 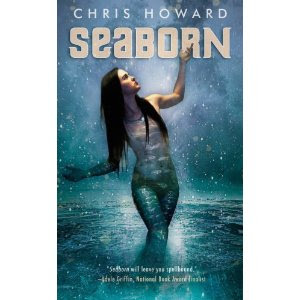 His first novel Seaborn was released in July 2008. He has a beautiful online graphic novel/web comic that he updates weekly, Saltwater Witch* (you can visit with your favorite Seaborn characters in the webcomic). His short stories appear in ezines frequently, and he has won the Heinlein Centennial Short Fiction contest. 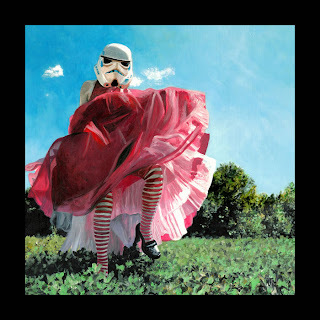 He is an illustrator and had work recently published in Shimmer Magazine. 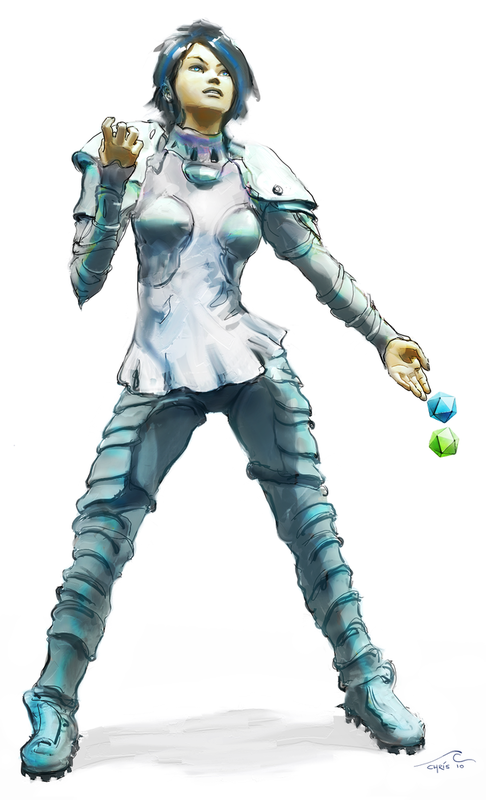 And if that wasn't enough, he drew a fierce femme gamer just for this interview. Game masters of the world – don't tick this one off. Who are some of your favorite authors and artists? Some of my favorite authors, most of whom have had a lasting influence on me, or whose books I just love and re-read or both: Neal Stephenson, Richard K. Morgan, Caitlín R. Kiernan, Terry Pratchett, Neil Gaiman, Connie Willis, William Gibson, Mary Renault. With a few minutes I could keep listing names, probably triple this list. My all time favorite artists are the neo-classical guys, Waterhouse, Bouguereau, Leighton, Alma-Tadema, and a few others. My favorite contemporary and contemporary-ish artists are Frank Frazetta, Zdzisław Beksiński, Dan Dos Santos, Michael Whelan, Donato Giancola, Stephan Martiniere, John Jude Palencar, Charles Vess, John Picacio, and again the list can go on. How do come up with names for your characters? I certainly have a preference for names beginning with the letter K. Totally admit it. I studied Ancient Greek a long time ago, and even though I've lost most of it, I love the feel of the language so much that many of my characters have Greek names: Kassandra, Theodora, Phaidra, Andromache, Kleariste, Klodia, Pheronika. The one that gets most readers who don't like hard to pronounce names is Kallixene, which isn't pronounced like Kalli-zeen, but Kalix-eh-nee. Any advice for aspiring writers and artists? I have two pieces of advice, both worthwhile everyone's heard them before: the more you do the better you get, and push yourself. Goes for writing and illustration, although I think I have more to say on writing. Every new story is in many ways better than the last, and all of us--writers and illustrators--are open to pushing into new territory (I don't know one writer who says I'm comfortable writing right here, thank you). Taking on bigger story ideas is built into us. Find that part of you and let it off the leash. Part of you should want to write characters who are in no way like yourself, characters with horrific internal struggles (that make your own look like neat little skirmishes), POV characters of the opposite gender, characters who begin the story with little sympathy—and you need to make it your job to turn the reader's mind. For the craft of writing, I'm a fan of NaNoWriMo. I haven't participated in a few years, but I can't think of a better way to build skill than writing as much as you can every day. Okay, I just thought of a couple more. ubmit your work, stories and art, to magazines, agents, book editors. So much of any publishing decision seems to be about getting your work noticed in the right place at the right time - no chance of that if you don't submit your work and keep submitting it. Get into a good writing program, class, or workshop. Join a critique group, online or off. If you're in the Boston area, look up the Ultimate SF Workshop (SF and fantasy) put on every year by Jeff Carver and Craig Shaw Gardner. Do you have a favorite part of the illustrating process - the sketching better than the coloring, etc? I think I like them equally for different reasons. The sketching part is all about the ideas, who or what is the subject, the perspective and angle - looking over a character's shoulder or directly in the eyes. The coloring and painting part is about finishing the work - in many cases painting over the sketch, and the painting adds so much. With color you're bringing in mood from a different direction. You can certainly show mood with pencil lines, arms folded angrily, facial expression, stance, but with color - a cold blue - everything just gets more interesting. The very first piece? The first I can remember was an awfully unfunny illustrated joke book I collaborated on with my sister, when I was nine or ten years old. I don't want to remember any of the jokes—that bad, but one must have involved a deep-sea diving hippopotamus, because I do remember drawing a hippo in a pretty fancy custom diving rig, with air hoses leading off the top of the page. And it must have been deep because hippos shouldn't have a problem with shallow waters—they certainly don't require diving gear in their natural habitat. You'd think there has to be a good joke to go with that, wouldn't you? I'm sure we didn't come up with it. If you skip ahead a few decades, then you get to my first written work published, a story called "Diminisher of Peace" about the god Wodan taking on a student, and the following year, "Always Becoming", about what it means to be a witch. Both of these appeared in The Harrow. When and where do you write and/or draw? Do you have a place you write and/or draw best? I draw and write where I can. Early in the morning, at lunch, late at night. I like to have quiet, but I write with headphones and music when it's too loud. I rely heavily on my journal to catch an idea when it shows up, because - too many times - I know I had a good idea and I didn't wake up to write down or draw, and it's gone. I recommend going back to the top of this article and browsing the pages of Saltwater Witch* to grasp the full range of Howard's skills. Don't be surprised if you end up reading for hours. Keep an eye out for Howard's upcoming short story for Fantasy Magazine in June - Lost Dogs and Fireplace Archelogy. *Chris is actually in the process of re-working the panels for Saltwater Witch, but they will start to be posted in all their beautiful glory soon. You can still browse his art on the site though. I got out my renfaire costume this week in preparation for attending my local renaissance faire (Southern California in Irwindale, I'll be there this Saturday 5/15). It seemed like a perfect time to talk about faire costumes for my Geek Fab column. 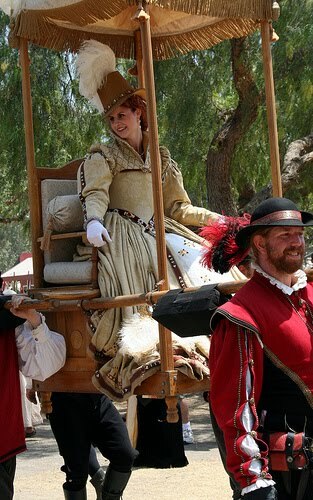 Click on over to Pink Raygun to read my renfaire costume tips and to see a photo of me in my favorite peasant costume. I've been considering a Star Wars movie marathon (episodes 4, 5, and 6) for some friends who have yet to see the Star Wars light. One of these friends was made into Lando Calrissian in the recent Star Wars Jib Jab video, and she had no idea who Lando was. - In a large bowl, cream together butter and sugar until smooth. Beat in eggs and vanilla. Stir in the flour, baking powder, and salt. Cover, and chill dough for at least one hour (or overnight). - Preheat oven to 400 degrees F (200 degrees C). Roll out dough on floured surface 1/4 to 1/2 inch thick. Cut into shapes with your fancy Star Wars cookie cutters. Place cookies 1 inch apart on ungreased cookie sheets. - Bake 6 to 8 minutes in preheated oven. Cool completely. I don't have anything new to say about Frank Frazetta, no amazing piece of biographical information... but I want to say goodbye. One of my favorite pieces of Frazetta's is the above painting, it was inspiration for the slave Leia costume. It's one among many beloved pieces though. I think he created fantasy art as we know it today. Frazetta inspired many, and his art will never fade. Rest in peace, Frank. Last week I had the chance to talk to the creators of the webcomic Contropussy. 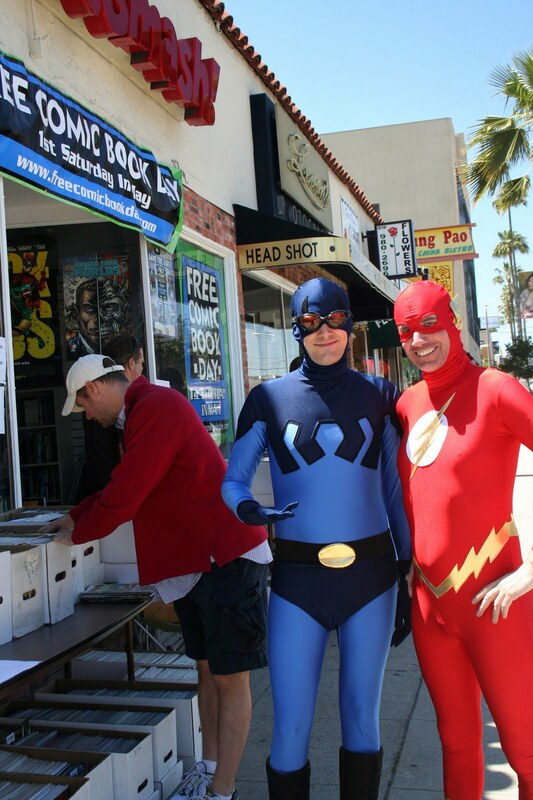 They were at Meltdown Comics in Hollywood for a signing of their limited edition first issue. You can check out my post about the creators and the comic over at Pink Raygun. 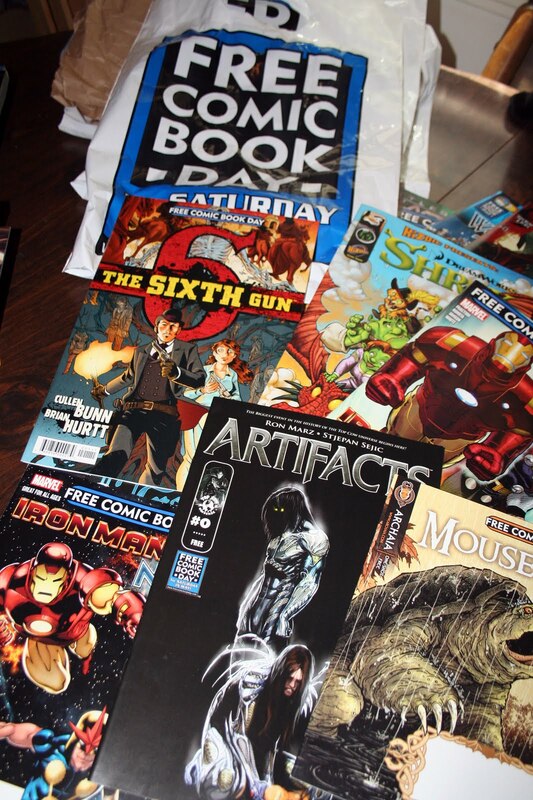 Remember how I mentioned that I scored major loot on Free Comic Book Day? Here are some quickie reviews on my favorites of the very large stack I read. I picked this up on a whim because it looked funny, and after I spotted the leading lady reading a Richard Castle novel on the first page, I knew it was my kinda story. 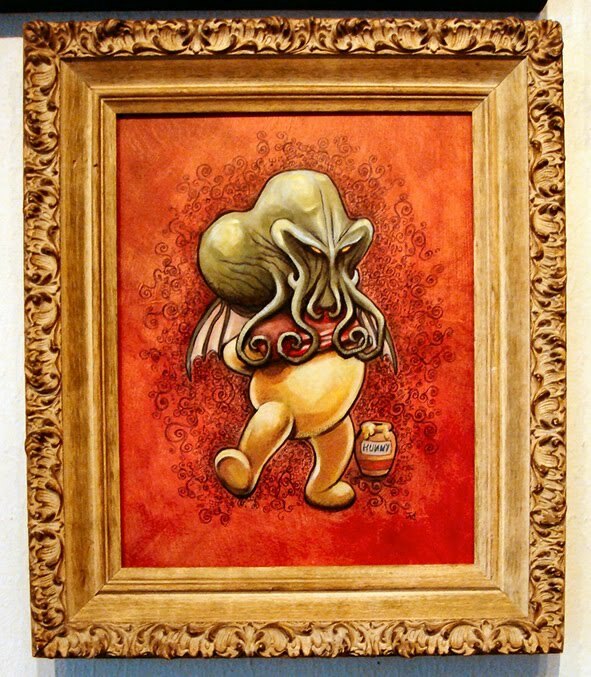 Love the charm, art, and nerdy references. Trades of this series went on my wishlist. I've read just enough of Witchblade to know I want to read more. 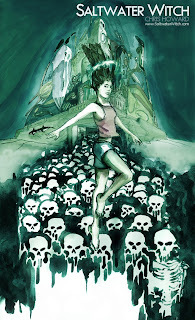 This issue tells us the secrets of the 12 other artifacts that determine the fate of the world. Some artifacts have more well, facts, known. The 13 issue series starts in July, and I will be pre-ordering and reading as much Witchblade and other Top Cow Productions as I can before then. This where I spill a geek confession. I've never read a Superman comic. I've seen a couple of movies, some of the TV episodes, and picked up enough along the way to get the basic story. I loved this issue. The story line grabbed me immediately - 100,000 not so happy Supermen vs Earth, and guess who's in the middle? Well done on writing it for broad appeal. I'll be picking up the next four issues. 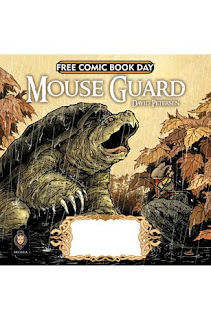 I already owned Mouse Guard, Fall 1152, but I grabbed this comic anyway. Not for Fraggle Rock, but to just drool over David Petersen's art and world. Everyone should give it more than a second glance. A comic set in the West (yes, capital W) with a supernatural twist - how could I not pick it up? It was lucky to snag it, it was gone fast at my first stop of the day. The Sixth Gun is a dangerous weapon that vanished after the Civil War. It's resurfaced though, and lots of people and creatures want it. A full issue, it still doesn't give away quite enough, but it works as I am curious enough to pick up the next issue when it continues in July. Funny and fresh interpretations of classic fairy tales and nursery rhymes make me giggle and this preview of a hardcover book (it's an anthology with lots of contributors) does a damn fine job. I enjoyed all the recreations, and I was sad when I got the end. Entertaining and perfectly suitable for all ages. The book is out later this year. You can read a little more about each of these comics and download previews by clicking on the cover art on this page. What were your guys' favorites from Free Comic Book Day? I have some duplicates and other FCBD issues that I will be giving away soon! How utterly screwed would the world be if the Elton Johns and Patrick Stewarts of the knighthood had to save Britain? Though I'm sure Patrick Stewart could give a mighty, “Make it so,” directive, Britain would be in trouble. 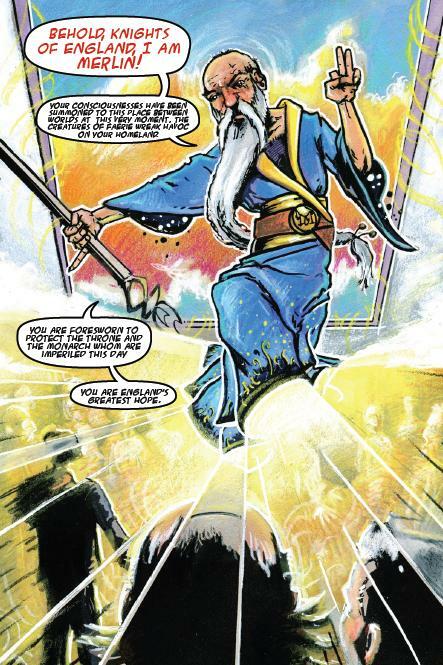 The Order of the Dagonet, Issue 1 published by Firetower Studios takes on just this possibility. Modern day Britain is invaded by a ticked off Oberon and Titania with their faery court after an ancient tree is uprooted by bulldozers. They are in no mood for reason or second chances. Desperate to fight the threat to his country, Merlin summons the knights of Britain. He does not get the heroic, armored knights of yore however. Instead, Britain's modern day knights, the Order of Dagonet, show up: Dizzy Claiborne, Sir Tottington, and Gene Everyman. I think this idea is intriguing and pretty damn brilliant. This first issue shows real potential, and the plot has so paths to take. Readers will definitely want to stay tuned to see how these three not-quite-heroes handle the tasks before them. The page layout will really grab your attention. The design is bold but not too all over the place. The layout flow is a bit interrupted in a couple of places, but one can still follow the story. The illustration style is not quite like anything I've seen. Warm colors with a bit of a soft dreamy blur around the edges fill the pages. Look twice at the art. The details really require a second glance. The layers of colors and textures really make the panels pop. I'm looking forward to seeing how these knights save the day. If they save the day. If you'd like your very own copy of this comic, ask your local comic store to order it or purchase it directly from The Order of Dagonet website. How awesome is this Ms. Marvel costume? I am of the opinion that it is marvelous (I enjoy puns, okay?). As all of Kelldar's costumes are. If you've not seen her work, you'll be blown away by this cosplayer's closet of clothes. What I would give to go to her house and play dress up! Check out my interview with Kelldar in my most recent Pink Raygun post. 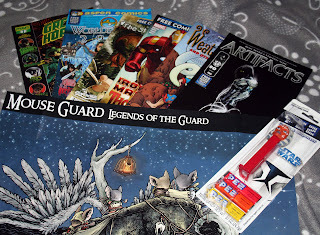 This year marked my first Free Comic Book Day (FCBD). It was like Christmas. Possibly better. I am lucky enough to live in a huge metro area (I almost never say that I'm lucky to be living in LA), so I decided to do free comic book day right. 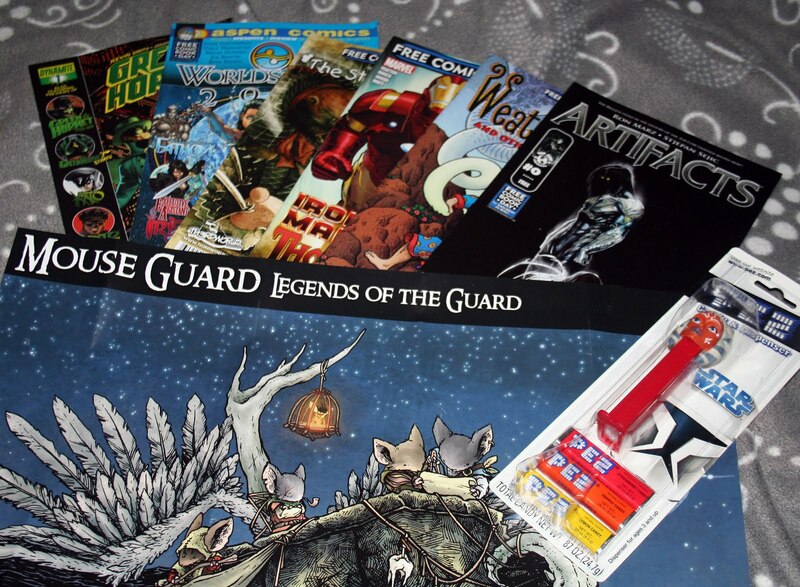 After finding a huge line up of participating stores through the FCBD site, I narrowed it down to a list of five based on proximity and in store happenings on Saturday. Three familiar stores and two new ones topped the list. I really could have visited comic stores non-stop on Saturday, but I didn't want to overdo it or get stuck in more LA traffic than was necessary. I'm a nerd so I made a list of stores, addresses, directions, hours, and scheduled events. I barely used said list, but I had fun making it. 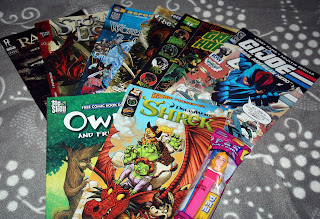 I also carefully reviewed the list of available comics and noted the ones I wanted to check out the most. First stop, bright and early for a Saturday at 10:30am, was Golden Apple Comics in Hollywood. They had this FCBD thing down. After I entered the store, I was directed to a line out the back door into the parking lot. The line led to a tent filled with the Holy Grail for the day - free comics. This Holy Grail was easy to obtain though and required almost no whip-cracking. They were giving away 10 free titles. Wow. I quickly knocked out my most wanted list. Golden Apple was easily the most organized store, even while crowded. In the back lot, they also had a handful of boxes of $5 trades and tons of boxes of $1 comics. Creators Jeff Nentrup & John Heffernan were signing the Radical Publishing free comic offering and Gambit, Rogue, and Ironwoman were wandering about. Finally, Golden Apple offered 25% off pretty much everything in the store. I left with a bag full of comics and graphic novels - free and not. 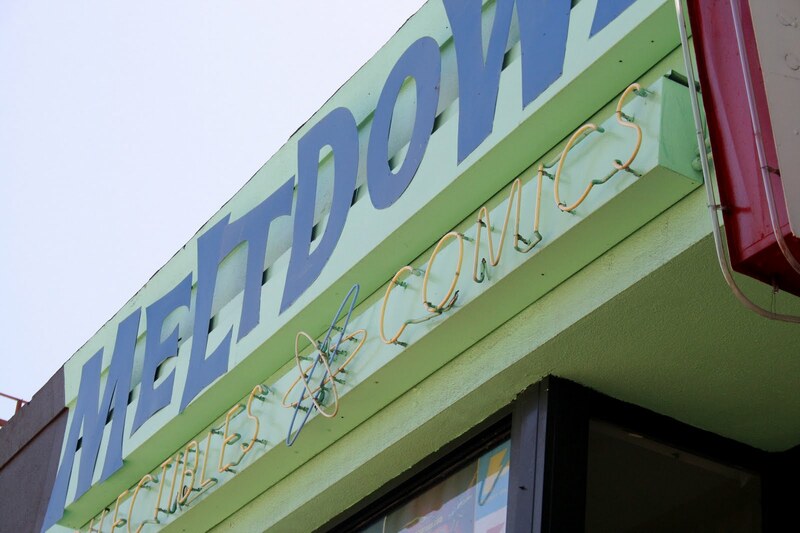 Next up, since I was in the neighborhood, was Meltdown Comics. It was my first time to the store, and I was impressed by the size. I think it's the biggest comic store I've been to, and they use the space really well. The line in went fast, and we were directed to the left to a glass case. We could choose 3 comics, and a couple of employees grabbed them from the case. After this you could line up to wait for a photo op with Red Fraggle or get your free Fraggle Rock comic signed by creators Sam Humphries and Jeremy Love. No sales, but I did grab a couple of indie comics on the way out. The next new-to-me comic shop was back up in the Valley, Collector's Paradise in Winnetka. Spiderman was on hand, and he was fantastic with the kids. They had five artists on hands doing sketches with 100% of the proceeds going to The Hero Initiative. You could grab 5 free comics from a large table of selections that were not only limited to the free comic list. I got some free issues of Battlestar Galactica here as well as Wolverine and Witchblade issues. The store was crowded with attendees waiting for sketches or signatures, but I browsed for a while anyway. They had a terrific sale - buy 2 get 1 free softcover graphic novels. I had to take advantage of that and dig through the bargain boxes. Marc Silvestri showed up just as I was leaving, and I am so regretting not staying to get a signature. I had a great experience at this store, super helpful staff, great stock - I'm sold. I can't wait to go back. My final stop was Comic Smash in Studio City. I've been here a couple of times, and always find what I'm looking for plus a little more. 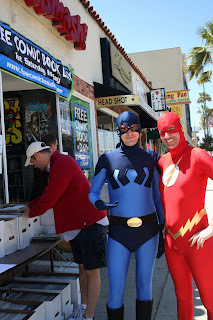 I was greeted by the Blue Beetle and Flash. Inside I found a 25% off graphic novel sale, so I found graphic novels to buy (never a hard thing to do). 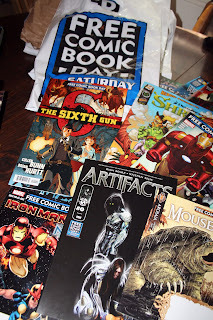 They handed me a hefty bag of free comics from behind the counter. It ended up being about 8 or so comics from the list and 5 or 6 other ones. Then I dug through the bins of comics outside because they were $0.25/each!! I'm not kidding. Everything from Spiderman to the Runaways to some Dungeon magazines. It was awesome for someone like me who has only stuck to limited universes so far to dig through and pick out comics to try. I found twelve or so to add to my stack. I had a damn fine first FCBD. I came home with a huge pile of freebies and an equally huge pile of purchases. I found new stores to visit and new series to follow. Yeah, I finished reading all my free issues late Sunday. I couldn't help it. I will be sharing them with some of my non-comic book reading friends to show them what they're missing.